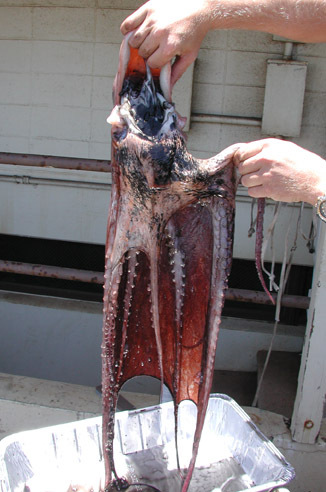 Brad DeRego and his buddies (the Waterdawgys) were diving outside of Baldwin Beach Park on the North Shore of Maui when one of the divers encountered a rare and strange creature that looked like it was part octopus and part squid. He collected the 8-lb octopus with his three-prong spear in 3 or 4 feet of water and submitted it to Dr. Richard Young of the University of Hawaii for identification. The creature was identified as Tremoctopus gracilis, a free-swimming octopus that carries the tentacles of a jellyfish and the Portuguese Man-O-War as defense against predators. Females are larger than the males (males only reach 5 to 10% of the female's size). The creature eventually found a home at Bishop Museum and was especially welcome there because it was the first specimen from the family Tremoctopididae to grace the museum's Malacology collection.